These July updates are awesome. I can't wait to build this! This is very awesome, was just about to order some components to finally get my APRS setup working. I haven't had a chance to look at the schematic yet but I'm guessing it would be fairly simple to bypass the HX1 and use your own transmitter? I have specific need to do this, I already have a transmitter with simple PTT button and input jack, and do not want to use the HX1. You might remember we spoke a couple of months back.. well I actually have the time/money to do this now haha! Without looking at the schems, I'm guessing it would be as easy as simply not using the hX1 and then wiring in my PTT signal line and input lines. Terry: good luck. It should work with any radio. I think I gave you some directions in our previous conversation as to how to interface with any radio (remember you'll probably need to invert the PTT logic with an NPN transistor and audio will likely need voltage conversion with a resistors divider). If you have a CRO, make sure you get a perfect sine wave on the receiver side and you're good to go. Is there a "for dummies" page for all of this? I would really like to use this system to track my balloon but I'm getting lost in the vernacular. Will I need an amateur radio license to operate this using the hx1? I apologize for the anonymous tag. My mobile device gave me trouble submitting otherwise. My name is Conrad. Hi, I had a question about the differences of using the trackuino shield versus the board. I plan on adding in things like wireless communication with the arduino for certain things while it's up in the air and thus I need it to be a part of the tracker, so I should go with the arduino shield right? Is completely different code required to use the trackuino shield than to use the trackuino board? how does that change things? also, how does powering it and everything else change from the trackuino board to the shield? 1) The shield is more flexible when it comes to extending functionality because you can stack more shields on it. Just make sure there are no pin conflicts between shields. The trackuino firmware uses pin D3 for audio, D4 for PTT, D9 for the buzzer and RX/TX for the GPS. Some other pins are used to get temperature readouts from external sensors (D6/D7/A0/A1). 2) The same code works unchanged on both boards. 3) You can power the Arduino + Shield through the Arduino jack (7.5 - 12V) or the Arduino Vin pin (same voltage). The stand-alone board is powered through the Vcc/GND terminal block with 6V-12V if you are using the HX1 radio or 9V-12V if using the MX146. Thanks so much! My name is Andy btw. Sorry about posting anonymously both these times. Is the PCB for the trackuino shield available on any site to order online or should I use the Eagle files to order it myself? Second to last anonymous: there are special versions of the HX1 that you can use on license-free frequencies. While you don't strictly need an amateur license to operate on those frequencies, you'll lose the ability to use the amateur APRS network to track your balloon. Andy: we're working on making the PCB available somewhere. For now, you'll have to order it yourself. Sorry. I've been having difficulty finding an available 8 V SRBMX146 online so I think I may use the 5 V SRBMX146LV instead. What hardware and/or software modification would I have to make to the trackuino shield to make this work? 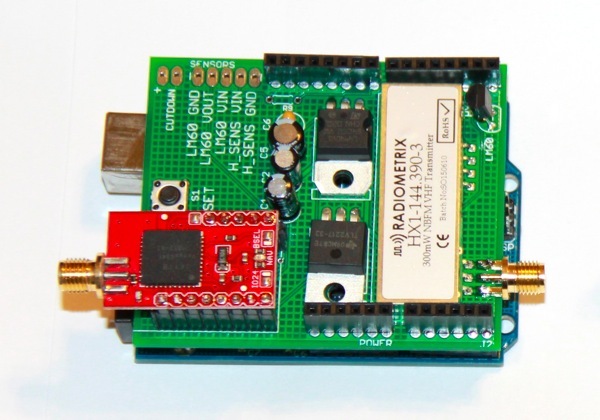 Steve: the trackuino shield only supports the HX1 radio. If you want to use the MX146LV, you can build the stand-alone board (see the project page). Everything in the schematic should be compatible except you can skip the 8V regulator (and its two related capacitors) and power the MX146LV from the output of the L4940 instead (by shorting together the output pads of both regulators, for example). Great project... Eagerly waiting for the BOM files and more updates... so that I can build the shield. I am building this, just received the HX1 and the Venus gps is on its way. Now I just need to order the board. If anyone is interested we could get the cost of the boards down if we bought more then one at a time.. I don't know at what quantity the price starts coming down but it cannot be that high. If you interested let me know. @Andy, @Dinesh, @Chris and anyone interested in group ordering: we just started a forum at http://hab-ham.org/forum/. Please join it. It's not too active yet, but that will be the place where we will centralize group orders of boards, components and maybe even balloons. On the trackuino shield Eagle file, what is the value of R9 (resistor 9). The file doesn't specify the value, only the series or model type or whatever that designation means. @Steve: you can skip that resistor altogether. R9 can be used to measure a capacitive humidity sensor (or any kind of capacitive sensor), but it's not implemented in the code yet. The idea is that the capacitor is charged by pulling D8 to +5v for a few milliseconds, then you pull it down to 0v and use A2 to measure the discharge rate through R9. That will give you a measure of the capacitance and thus, the humidity. R9 should be chosen so that the RC time constant is within a reasonable and measurable range. Hope it clears things up? Hello everyone, iv been looking at the board for this as i would love to build one (as a learning curve, and just because its a very interesting thing to do). i was looking at the eagle file and just wondered why are all the negative connections on the PCB unconnected? Click on the ratsnest or the auto-router buttons and you'll see the copper pour. I would like to do it by myself, but I'm unsure about compatibility. I am very interested in building this shield for use this spring in conjunction with a launch. I am working with a class at local school to incorporate it into a weather section and would love to be able to gather data during flight. Anyone have a BOM for the build? Javi, School is shooting for late April for launch. Does it look like you'll have something in time for that, or should I start looking for an alternative? Will this shield be available on BatchPCB? Any update on the BOM? BOM would be great (for farnell) Would You be so kind to post it for us? There is a Mouser BOM list on HAB HAM forum (good for USA but some of those parts are difficult to find in europe). What about rev2 shield? Any progress? Thanks for your help!! Great project!! Aaron/Jesper: I'm working on a revision of the shield with a few new features: a battery meter, 3.3/5V operation and on-board buzzer driver for louder recovery aid. Just ordered the boards from iteadstudio and they are coming my way. I'll post updated eagle files and a mouser cart as soon as I'm done testing. I'll make sure all the parts are available in Europe since I'm from Europe too. Thanks Javi. Will the boards be available for sale too? Or at least at BatchPCB? I will post the gerber files, so you will be able to order it anywhere. I've recently used iteadstudio, which I believe is cheaper than batchpcb. Javi, wondering where you are at on the updated project. Jr. High class I am working with is getting close to weather study and ballon launch. Hi, I would like to use this on a camping trip across the appalachian mountains so my friends can track my progress online. Does this work at the ground level, or only at high altitude? Are the voltage regulators necessary in this design? Looking at the schematics, the Trackuino shield regulators do the same job as the on-board Arduino regulators, do they supply higher amperage necessary for the components? The 5V output should be enough to power the radio, but the FTDI's 3V3 is definitely too weak for the GPS. I'm talking about the Duemilanove, not sure about the newer Unos since they don't have a FTDI chip anymore. Another side effect (feature or defect, your call :)) is that the shield won't use any power when connected to the computer's USB port. I think I see now, originally I thought the 3.3v & 5v voltage regulators were connected to the Arduino's supply voltage (which had me raising my eye brows), but upon second glance, looks like you just take the VIN from the Arduino and get your own supply from that. Further note: Seems the Arduino 3.3v supply is limited to 50mA draw, not much at all! So basically, what else do I need to transmit and receive on earth and on the objects (car in this case)? How do I track which car is transmitting back the signal? I am new in this hardware area, if you can help me it would be nice. Also, is this new version available for purchase? cool is a good projekt for an ballon tracker with more sensors and telemetrie. i need the arduino code, i build an ballon tracker for an school porojekt. I have shield beta boards available for $5 each if anyone is interested. Is there a way to just transmit telemetry data? I don't want to transmit GPS positions. How can i change the code to achive that. Any idea whether it would be possible to use this gps rather than the venus? Craig: I have plans to migrate away from sparkfun GPSs to adafruit's in the near future. Is this true, and if so, am I currently out of luck for making a trackuino? Build the 2.2 board and use the 1.4 firmware. That should work and it's compatible with the newer gps part. Where can I but the Trackuino board with nothing soldered to it? Is there a possibility to buy the pcb with the components already soldered? Where can I buy just the trackuino board, with none of the components attached to it yet? One of the best devices on the market right now if compare with similar for sure, I have been using it for 1 year and should say that I completely satisfied with this tool. So if you wanna buy it, dont think too much, just take as soon as possible. Also I wanna add that I use automobile tracking software https://uboro.io/ that always is a cool thing and works amazing. 1) When I click on the forum at the top of the page it takes to tab that states "Page Ok". Wondering what is wrong. Is the correct place for questions. 2) I have built a Trackuino page and when it transmits the audio message sounds slow compared to others I hear. It seems the baud rate is incorrect. Any suggestions on where I should start looking?